Uncover the history of one of the twentieth century's most contentious and reviled systems of government. This is an essential resource for the study of the apartheid era in Southern Africa, sourced exclusively from The National Archives UK. It provides unparalleled analysis of South African politics, trade relations, international opinion and humanitarian dilemmas against a backdrop of waning colonialism and mounting world condemnation. The content spans 30 years, from the election of the National Party in 1948 through to 1980; a period in which South Africa faced increasing international resistance and boycotts, internal strikes and violent demonstrations. Previously restricted letters, diplomatic dispatches, reports, trial papers, activist biographies and first-hand accounts allow students and researchers to explore in detail the changing relationship of the South African government with its own people and with the wider international community. Apartheid South Africa, 1948-1980 is part of Archives Direct, a cross-searchable multi-product platform, sourced from The National Archives, UK. Published booklets, leaflets, propaganda etc. 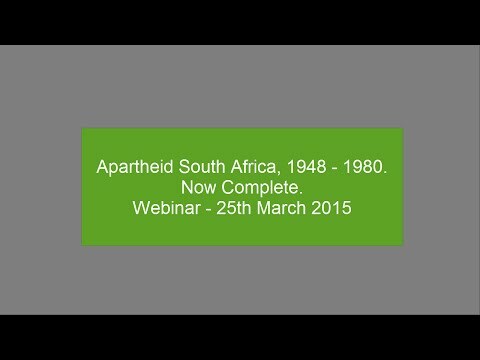 Browse links to carefully selected websites for further information on South Africa and apartheid. Extraordinary collection available to students and scholars studying African history, apartheid, international relations, and global politics.